That fire sure looks like it would make the house cozy. I heat by natural gas but we keep the thermostat low and at night while sitting around use the fireplace to raise the temperature a little. I know that my fireplace is probably the mouse inefficient use of wood. Insurance companies frown on wood furnaces. living in latitudes simular to Alaska and Siberia, winters are obviously dark. This winter was strange however, no snow and hardly freezing until christmas and then suddenly snow and around -30 C (-20 F) ever since. Today a couple inches of snow and a heat wave, -5 C (23 F). I’ve worked full time for almost 30 years in a paper mill 10 miles from here. I work 3-shifts. ( I tried another job for a couple of years in the middle, but that’s another story). Yesterday morning I got home from working nights and I now have 4 days off. Working 7 in a row and 4 off all year around, 11 days vacation in the summer. Days off, meaning work at home, of course. Same thing for most of us, I guess. Apart from collecting a few bits and pieces of junk there has been no development on the gasifier since november. …I’ll get the welder outside and plug it in. I’m looking forward to your wood prepping story and pics. Primary air inlet will close by gravity and the fire will cool down in a few minutes. A little heat driven circulation still going on, just enough to keep the boiler from boiling. I’ve had a few power outs over the years and it works. I believe this is similar to what is being described. Yes, very simular. There are several commercial brands out there. Don’t use a positive pressure system. Especially if mounted indoors. You risk CO and smell. Don’t use the “on/off” mode. You will tar up your system and eventually risk a chimney fire. Use a storage tank and full blast through out the whole burn. 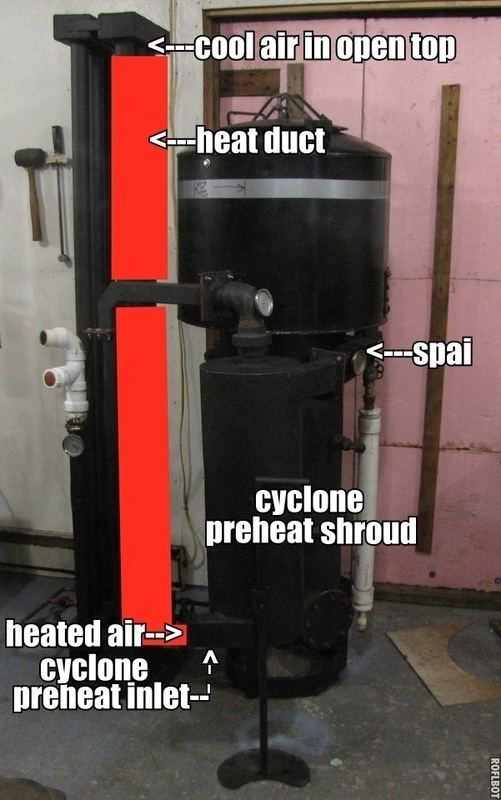 Thanks for posting the wood gasification boiler video. I picked up a couple more ideas for preheat. One I can semi try is pulling my inlet air through a shroud around my cooling tubes and in turn feeding that heated air into my present cyclone preheat arrangement. My shroud would only surround the first 3 and hottest tubes. I’m sure I can reduce the size of my cooler as I can now hold my hand on the last 2 tubes as they are just warm during full operation. I know now that my firetube could be shorter, wasn’t sure about this when I started. Now to draw a preliminary design of a more compact unit. Fun! The single port air inlet (SPAI) feeds a circular manifold with 5 feeds to the nozzles. Jo: yes, I agree, a natural draft system is safer, and a sounder design, but otherwise essentially the same as what they illustrate. If pressurized air is introduced in the combustion chamber, that would be safer, and should eliminate smoke for start up, inducing a slight vacuum in the fire box. If pressurized air is introduced in the combustion chamber, that would be safer, and should eliminate smoke for start up, inducing a slight vacuum in the fire box. I highly recomend constant vacum mode. I always light up in downdraft mode. Natural draft alone however has its downsides. Gloomy days or a cold chimney at lightup will often make you wish for better draft. Thats why I use a small squirrel fan on the chimney top. It’s fed by a motor dimmer from an old vacum cleaner. I can adjust to the vacum I choose. If you want a maintenace free fan you can make your own ejector fan from two different size paint buckets. This way the fan always breathes only clean air and natural draft is still there with no restriction. A couple years back a DOW member told me that if you’re not handsome enough you can always brag about how cheap you are to get approval from the ladies. 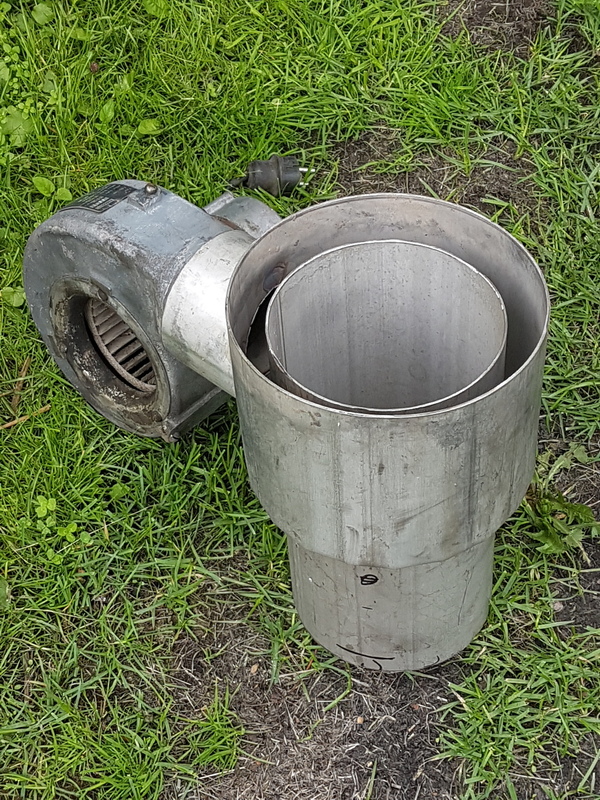 Today I used some leftovers from gasifier builds to fabricate an ejector blower. 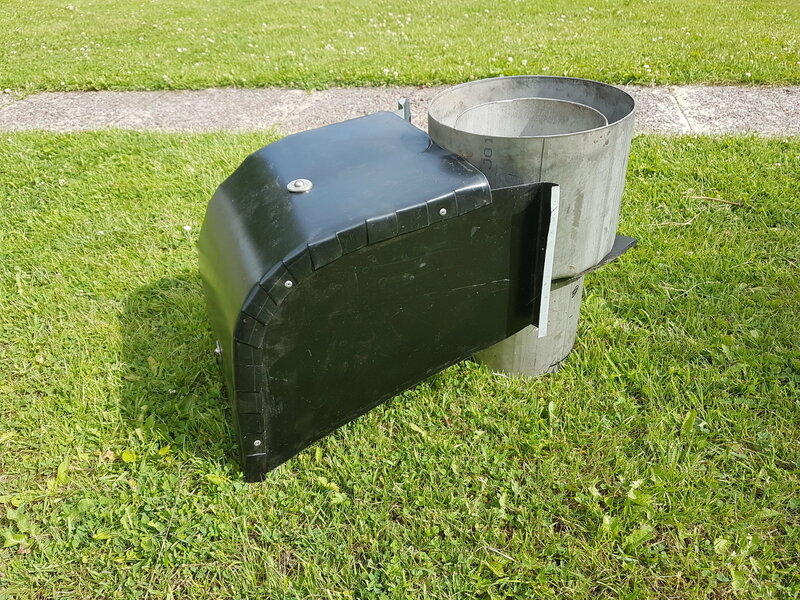 Also to protect the motor I used flat roof tin which were leftovers from the rebak guards, which in turn were leftovers from when I built my porch roof 25 years ago.